We are offering Chip Spreader to our client. Technical Specification of Chip Spreader Weight of 2.25 M Model - 650 Kg. (Approx). Weight of 2.2 M Model - 700 Kg. (Approx). Body Constructed form 4mm pressed steel plate with hollow square and rectangular reinforcing sections and channels. Features: Custom built ranging from 200kg & 2000kg. - Accessories: Aluminum perforated Trays & Steel trolleys. - Fuel: Wood/Agro waste/Liquid Petroleum Gas. Constructed form 4mm pressed steel plate with hollow square and rectangular reinforcing sections and channels. Serrated surface feed roller constructed from 165 mm (11/2") diameter tube mounted between self aligning lubricated for life bearings. Minerva TOP CHIP SPREDER Is durable & made of HEAVY DUTY steel for ultimate performance which is used for laying of chip on the road surface before laying of asphalt & aggregate mix. : Chip spreader is suitable for Laying a material from 10mm to 65mm in proper thickness for surface dressing work. 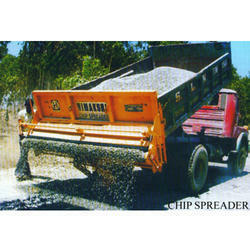 : The chip spreader is available in two models. We offer a qualitative range of chip spreaders to our reputed clients. Our range of chip spreaders are ideal for laying a material from 10 mm to 65 mm in proper thickness for surface dressing work. These spreaders are manufactured using the finest grade raw materials that we procure from the most reliable sources in the market. 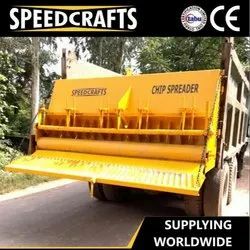 Chip spreader: Chip spreader means a fast great laying system in lower cart for base materials up to 75 mm equal laying of aggregate in proper thickness for surface dressing.